As you’re more than aware, iOS 8 is out and it’s packed with a lot of great features. But suppose you’ve updated from iOS 7 to the latest version of iOS and aren’t entirely pleased with it. Perhaps you have an older iPad or iPhone and find it runs more slowly, or your favorite apps don’t behave well with it. For the time being, you can revert to iOS 7, but you probably won’t be able to for long. In order to install an older version of iOS, Apple must continue to authorize it (something it calls “signing”). Generally, Apple stops signing older versions of iOS within days of the newest version shipping. As I write this, it’s still possible. But it may not be in the very near future, so act now if you’re going to at all. The first trick is finding a copy of iOS 7.1.2 for your device. If you’re lucky you’ll find it by going to the Library folder in your user folder (hold down the Option key and then click on the Go menu to see the Library folder) and then look in the iTunes folder for some variety of Software Updates folder. Again, with luck, the iOS installer package you need is there. However, these packages are routinely deleted by the Mac OS so yours may be gone. In that case you’ll want to turn to your web browser to search for iOS 7.1.2 ipsw. You’ll find a number of sites that can lead you to the files you need. Be sure to get the one that applies to your specific device. Once you’ve downloaded it, plug your device into your Mac and then launch iTunes. Select your device and click on the Summary tab. Back up your device because you’re going to wipe all the data from it. 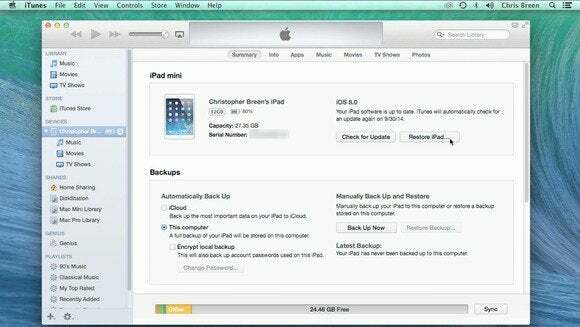 Once it’s been restored you can then click the Restore Backup button to put your data and apps back on the device.